Millions of people rely on buses as a form of transportation whether as a means to get to work or school or to travel to a destination for recreation and relaxation. Whenever a bus accident results in the injury of passengers, it is essential to determine the exact cause of the incident and which people or parties are liable for the repayment of all costs associated with the victims’ injuries. Regardless of whether bus drivers have good intentions or not, they are to be held accountable when their actions or failure to act appropriately harms others, and their employers carry the same burden. Bus accidents can be caused by a combination of many factors, and it may be hard to determine the exact cause of a crash. The factors that contribute most to bus accidents include the following. Bus Driver Fatigue— Bus drivers who are involved in accidents are commonly fatigued whether due to lack of sleep, overwork or medical conditions that prevent them from getting recuperative sleep that is needed to maintain awareness and remain alert behind the wheel. Employers can be responsible for driver fatigue as well if they encourage or force drivers to work longer shifts or more hours than allowed by law. Disobeying Traffic Laws— Speeding is not uncommon among bus drivers and is more likely to occur among those who must operate on tight schedules and make routine stops. If a driver falls behind schedule, he or she may speed to make up time and could violate other traffic laws in the process. Improper lane usage, signaling, and aggressive driving can all cause accidents that are easily preventable. Problematic Passengers— Some accidents are the result of distractions brought about by passengers who refuse to follow the rules, provoke others or are a general nuisance to others. A bus driver must know when to remove a passenger or to contact the authorities when the passenger’s actions have become a threat to others on the bus. Influence of Drugs and Alcohol— Drugs and alcohol significantly affect the reaction time and judgment of drivers that are influenced by them. While illegal drug and alcohol use is associated with some accidents, others may be the result of using over the counter drugs that have problematic side effects such as drowsiness and dizziness. Failure to Take Required Time Off— Drivers of all commercial vehicles are required to keep logs of their service hours and time taken off between shifts. They may not exceed a certain number of consecutive hours and must have enough time off to get a full night’s rest before resuming their duties. Employers may force employees to break these laws, or they may do so willfully if they are trying to earn additional pay. When driver fatigue is a contributing factor in an accident, one of the first questions that need to be asked is whether the driver was in violation of his or her hours of service requirements. Equipment Malfunction or Failure— In some cases, the driver is unable to avoid an accident due to the failure of critical equipment such as brakes, tires or the steering column. 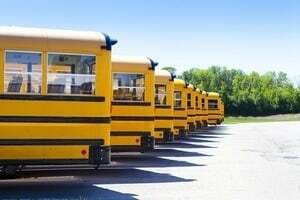 Bus charters are required to perform regular inspections of their buses and to maintain and repair buses so that they can reliably transport passengers without incident. When equipment failure is the cause of an accident, the liability can be shared between those responsible for performing maintenance, the company itself and the manufacturer of the defective equipment. Driver Error— Sometimes the cause of an accident is nothing more than a wrong decision and nothing more. Nobody is perfect, and drivers are insured to provide compensation should they be liable for a crash. If you’ve been injured in an accident involving a bus as a motorist, passenger or pedestrian, contact Rosenfeld Injury Lawyers LLC today to schedule a free consultation with a bus accident attorney who can discuss the details of your case with you and let you know more about your rights and legal options. Should we be unable to assist you or fail to secure damages on your behalf, you will owe us nothing, and our time, services and advice will all be free of charge.